A trip going through all the states on the mainland can be one of the most educational and exciting experiences of your life. An extended learning experience that teaches you about history, culture and geography; really getting to know your country while having fun checking out all the states. One of the greatest experiences for an RVer is to actually be able to say that they traveled through all fifty states. 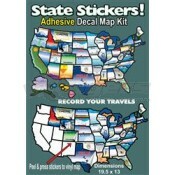 A good way to be able to visualize and keep track of that is with a state sticker kit. Add a sticker for every new state that you visit. This is a great teaching tool for kids, since most kids learn better with visuals; a sticker map lets them see exactly where they have been. A sticker map helps you absorb the vastness of land travelled; from the historic site of the east, to the beautiful beaches of the south, and the vast farmlands of theMidwestto the rocky coasts in the west. You and your family can see it all and keep track of all your travels with these removable stickers. From the extreme road tripper that does all 48 states in nine days or less, to the leisurely trip through the mainland of theUnited Statesa state map is a great tool to help visualize all the distance you have travelled. Make a game of it, or just give your kids a fun way to learn some geography with this state sticker kit. They will be able to peel off or add more states as you go along on each trip. A state sticker kit is also great if you are breaking your 48 state road trip into different parts. It will help the kids remember what you did before and keep track of where you are going next.